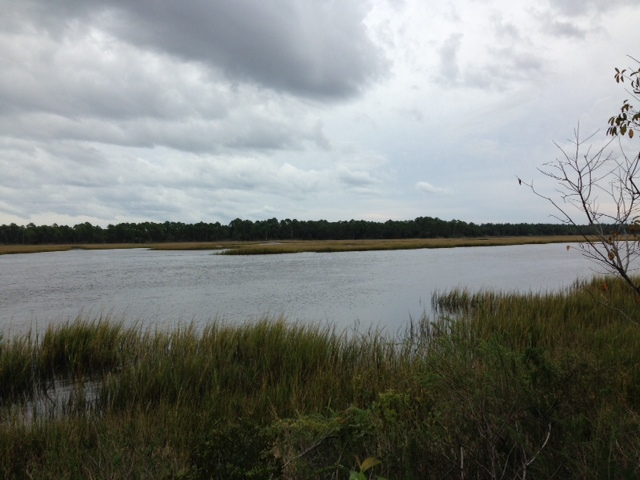 This weekend my wife Sharon and I visited some of the Jacksonville area State parks. The weather was crisp in the morning with temperatures in the low 50’s, and then heating up to around 70 as a high. The wind made it feel about 10 degrees cooler with a stiff 10-12 out of the west. The first park I fished at was Pumpkin Hill Creek Reserve. It is located on east side of town near the beaches. I did not have a lot of area to fish here, and failed to bring proper wading gear. This made it difficult since most of the shore was covered in sawgrass. I guess that is the best excuse I have since I never had a bite in the two hours that we were there. I am only fishing with artificial lures in my tour of the parks, so live bait is not an alternative for me. I did see a lot of bait being chased, but with the mucky bottom, and no chance to wade, I could not get close enough to make a cast. Still, a very picturesque park, and seems to be a great place to kayak. The next stop was Little Talbot State Park, just south of Amelia Island. I got there when the tide was just coming in. 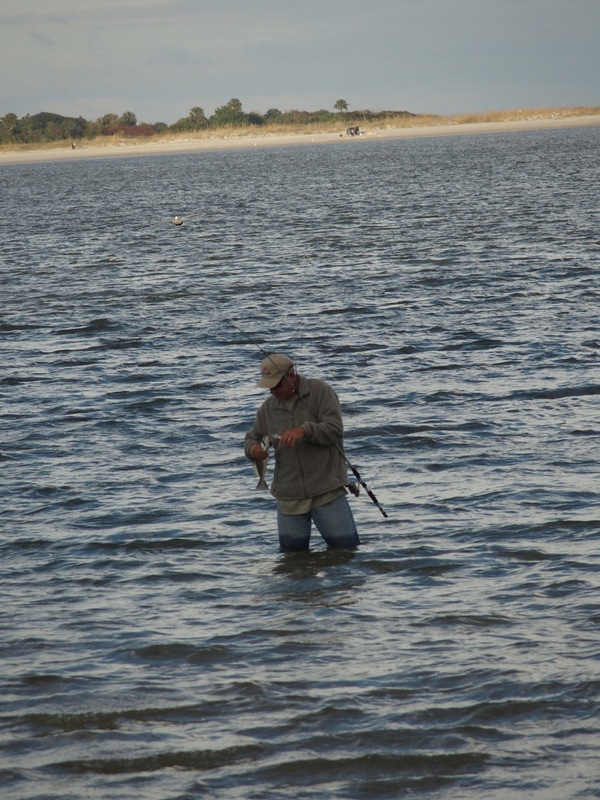 The spot I started fishing was a cut that had nice tidal current and was a deep drop with a sandbar on the far side. I caught a nice Whiting on a rattletrap that resembled the bait they were eating. After numerous cast, I decided to switch to my old reliable Yozuri L Minnow in trout color. 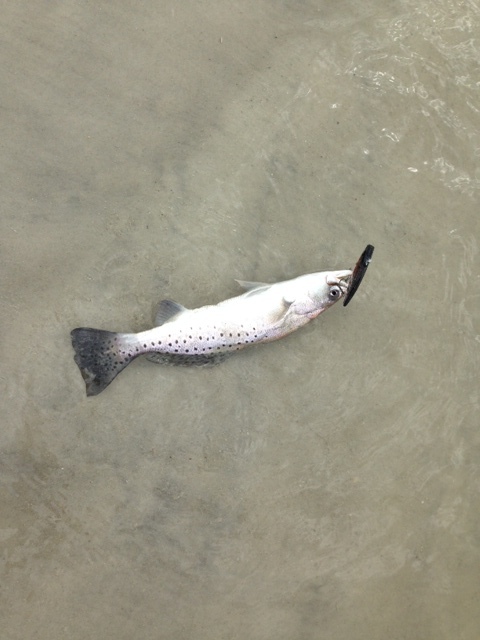 It worked on almost my first cast when I saw some bait scatter, and I picked off this nice trout. 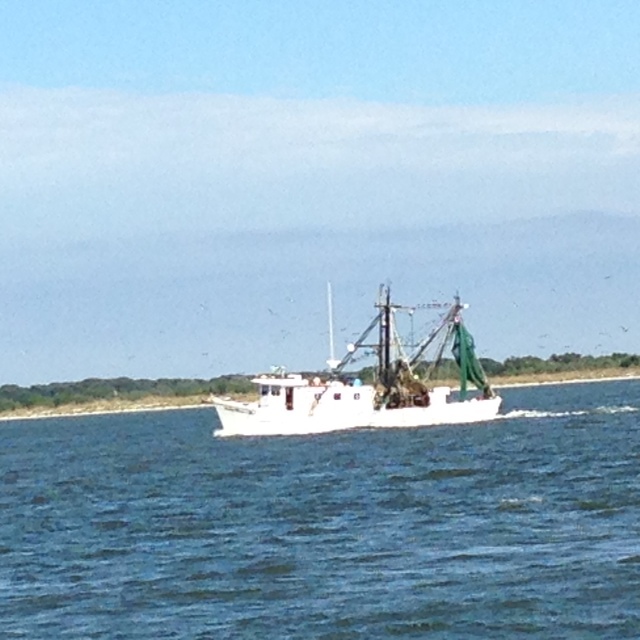 We spent the night in Fernandina Beach just north of Amelia Island. If you haven’t been there, it is a very nice little town with some great restaurants and live music at night. Just down the street from our hotel, we stopped at Fort Clinch State Park in the morning. It had been raining at night, and it just stopped as we drove off. 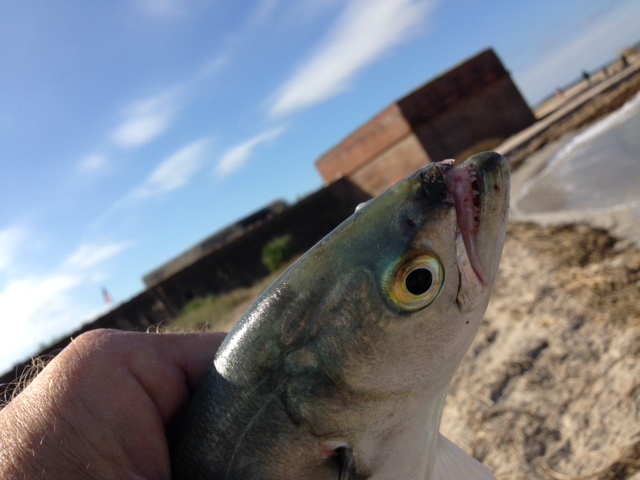 I fished right behind the Fort where they have a rock jetty on the northwest side of the park. The waves were really rolling in, and the only thought I had was to make long cast with my rattletrap for distance. I stood on the rocks and casted as far as I could. 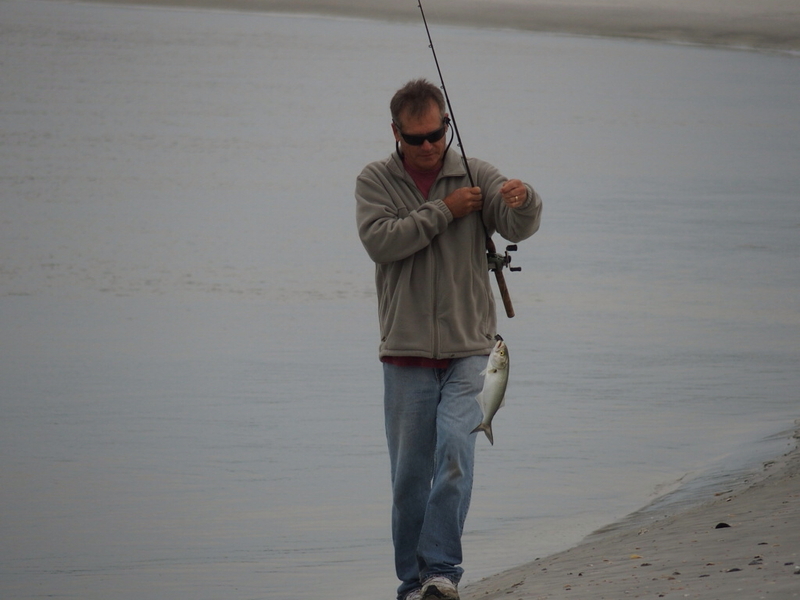 I picked off a whiting on my first couple casts, so I thought this would be easy…..
No such luck as I casted for about an hour and half and moved many times for just 2 whiting. 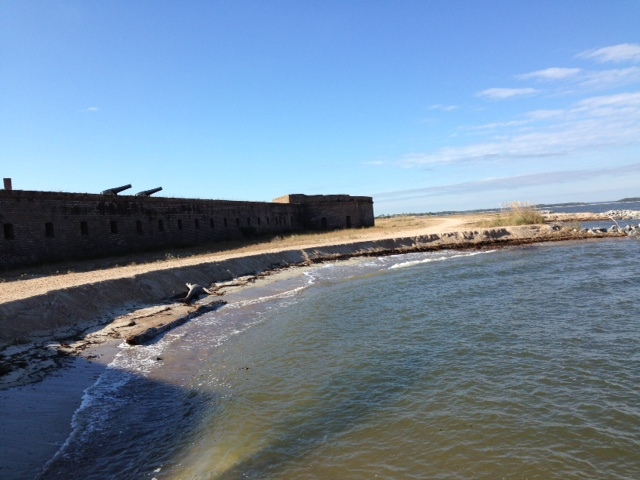 It still was a very cool place to fwiht the historic Fort behind me and the pounding surf! We also stopped at Big Talbot and Amelia Island State Parks. It was trout time! At Amelia Island there is a bridge that you can walk that is now a state park and is closed to traffic. A great place to fish if you can find a place on the bridge and use live bait. Since I am casting lures, I needed to employ a different strategy. The Nassau Sound has feeder creeks, and just to west of the bridge is a creek and the tide was moving out when I arrived. I used the rattletrap to make long cast and caught this nice trout. The last stop was Big Talbot State Park. I was trying to talk Sharon out of painting here, and come back another day, but she was determined. We hiked a quarter mile down to the beach, and the driftwood covered the beach. The only way I could cast was to wade, and it would require getting my jeans soaked. It paid off as the trout were feeding. What a great way to end the weekend! This entry was posted in Uncategorized on November 10, 2014 by shurstrike.